Lester William Polsfuss is credited with being a major player in the pioneering of electric guitars with his solid-body (no acoustic resonance chamber) model... but you probably knew that. As if being a popular musician and, along with wife Mary Ford, selling millions of records wasn't enough, Les Paul was an experimenter and inventor in the electronic music realm. Here is what was at the time (1958) a contemporary look inside his home-workshop-studio. Mr. Polsfuss designed and built the record cutter that he used in his early days out of scrounged automobile and aircraft parts. Pretty impressive. A tour through. the popular guitarist's studio home reveals some of the equipment and techniques he uses to blend the electronic and musical arts into his exciting "New Sound." The scene on our cover might well have been photographed in a large metropolitan broadcast studio - but it wasn't! This ultra-modern setup is in a conventional-looking country home literally nestled in one of the mountain-hills of northern New Jersey. It is part of the workshop-home of Les Paul and Mary Ford, that pair who enthrall music lovers and enthuse audio technicians by using electronics to multiply their talents. The visitor's first impression is that of more mikes than he has ever seen in a broadcast studio. Then he views to his left a large control room on the other side of a plate-glass partition, several broadcast type tape recorders, an ancient piano (obviously from an early movie theater), a couple of vintage phonographs (Edison and Gem) and several guitars. A small portion of the studio. 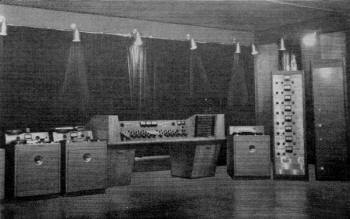 At left are two standard Ampex tape recorders; center is the Monster; at its right the Octopus, flanked by its eight amplifiers and - at the extreme right - the power supplies for the equipment. But the technician is struck chiefly by the big control console that dominates the center of the photograph on this page, and even more by Les' attitude toward it. Referring to it affectionately as "The Monster," he swings the panel up on its hinges, props it with an old piece of board kept inside and points out the 19 low-level amplifiers in its belly. The console - a complete control for stereo with a third channel if needed - has a complete set of filters to attenuate any part of the audio spectrum, and a fantastically flexible switching and patching system. 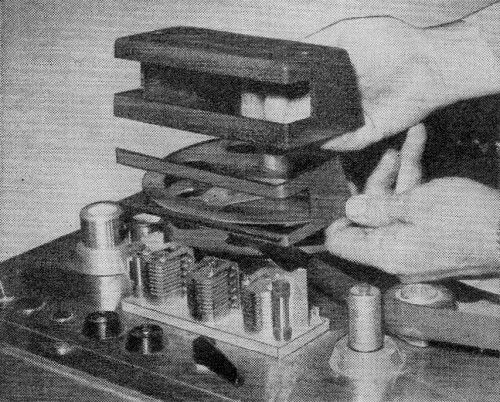 An audio oscillator (for checking) forms part of the console, and a vibrato unit (built, incidentally, from the Radio-Electronics article on page 57 of the March, 1957, issue) is built into one end of the console. 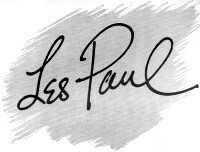 Les Paul is an artist who has made his way to success by making practical electronics part of his art. His "New Sound" (sometimes called "the Les Paul effect" by audio technicians) is, of course, an application of electronic techniques. 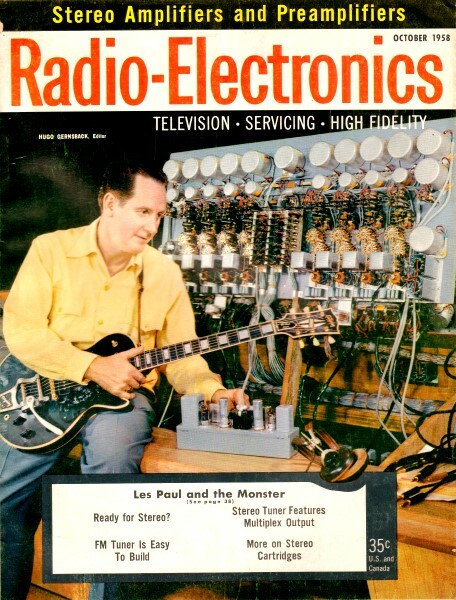 What is not so well known is that Les Paul has been a researcher and experimenter in the electronic end of the recording field since early in his career - even before his career. His first venture into electronic music was at the age of 13 in his boyhood home in Waukesha, Wisconsin. Fascinated by the family's radio-phone combination - a Kolster - and discontented with the volume level of his first guitar, he decided to combine the two. 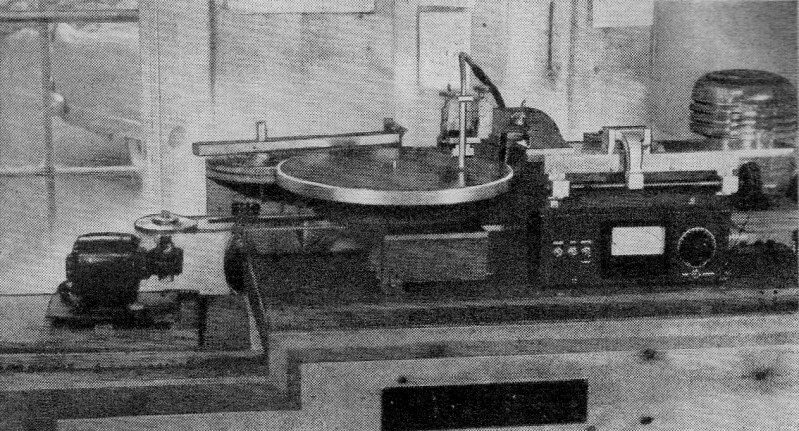 The phono cartridge was taped to the body of the guitar, with the sharp needle embedded in the wood and the output fed into the phonograph input. The experiment was successful, and Les had a guitar that would play at any level he liked, to the limit of the set's volume control. From this crude contact pickup to home recording was just a step. A trip to Milwaukee netted another pickup and a Western Electric double-button mike. An old spring-wound console Victrola became the recorder. The 13-year-old experimenter placed the new pickup in its tone arm and connected the new mike and old guitar pickup to the amplifier input. The record blanks were, of course, the pre-grooved type available to experimenters before World War II. Les was not too satisfied with the recordings, but remembers that his mother used it later to record him over the air from WHAD in Milwaukee, where he started to play in 1930, at the age of 14. The first recording assignment for which he was actually paid, however, did not come till 1931, when he made his first commercial record (Deep-Elm Blues on one side and Just Because on the other) for Champion Records. Close-up of Octopus shows width of tape and the eight-track heads. Throughout his early recording career, Les always sensed something not quite right in his recordings. Possibly the horrible quality of some of his own boyhood efforts had revealed to him that - the engineers to the contrary - a recording setup need not be automatically perfect. Finally, in 1942, during a recording session with Bing Crosby, he declared his opinion. The stuff just wasn't right, he said. A singer shouldn't sound as if he had his head in a rain barrel. The recording engineer was too much amused at this outbreak from a mere musician to be insulted, but his recording partner took the matter seriously and invited Les to do something about it - if he was convinced that something could be done. And Les was. Forsaking the profitable side of recording, he set up in a Hollywood garage a studio to be devoted to research. The recorder - still used occasionally - was a home-built job, with a Cadillac flywheel for the turntable and airplane surplus parts for much of the rotating machinery. The bed of 3/16-inch boiler plate adds to its "built-like-a-battleship" appearance. Les says it's completely vibrationless, and the idea seems plausible. In this garage studio Les worked from 1944 to 1950, always searching for better sound. At first the research represented a steady expenditure, but toward the end of the period its reputation grew till it threatened to become a commercial success and Les had to hire two other people to take care of the work. 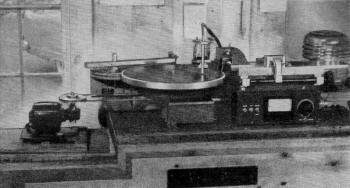 Possibly the most successful result of the research period was that of multiple sound on a record. 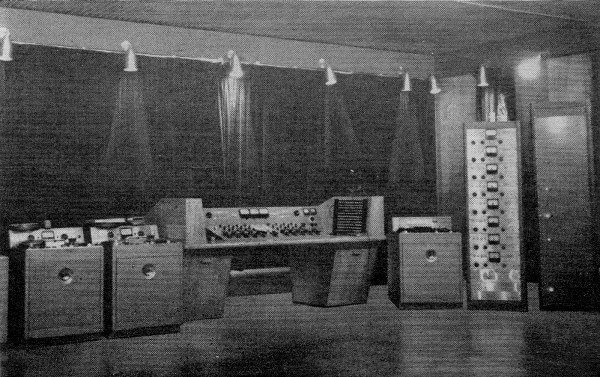 After much experimenting with adding parts - the "Les Paul effect" of decaying echo - and the expenditure of more than 500 recording blanks, Lover and Brazil were produced. An auto accident at this time put Les in the hospital for nearly 2 years and ended the garage period. During the latter part of his hospitalization he had time to study his problems further, and one of the results was a switch to tape as the recording medium for the New Sound. The Les Paul cutter, plus a playback arm. The two flat slabs under motor and cutter are iron plate. With the new tape machine, Les and Mary settled down temporarily in Jackson Heights, N. Y., and with it recorded some of their greatest successes. Here for the first time Les ran into a new technical difficulty - neighbor trouble. Their life in show business had conditioned them to "getting up early in the evening" and doing most of their serious work after the show closed. To avoid eviction, they had to modify those hours somewhat. Even then, some work was done to the accompaniment of tenants pounding the ceiling. One recording, Just One More Chance, was actually made with Mary singing with her head under a blanket, apparently without adding any new effect that could be noted. The only disadvantage of the tape machine was that each recording was necessarily erased in making the next, so that an accident in, say, the 11th part would make it necessary to do the first 10 all over again. This was the reason for "The Octopus" - it cured that weakness. That instrument is another Ampex tape recorder, but with a tape 1 inch wide. Eight parts can be recorded side by side on its eight tracks. They can be blended as required, or one or more can be rejected and new parts substituted, without losing recordings that may be useful. They can be mixed on the control console and a trial tape made up. If the composite recording is not all that might be desired, it is a simple matter to erase it and try another arrangement. The original eight tracks can still be drawn on at will. The Octopus sits at the right of the control console in the photograph. To the left of the Monster are two conventional Ampexes, and to the right of the Octopus are its eight amplifiers. The tall rack at the edge of the picture contains the power supply for the whole equipment. But this is not the whole story. Once the visitor has recovered somewhat from the overwhelming effect of all this equipment, Les takes him out to the "new studio," which was apparently the old barn. The inside is a complete television studio, two stories high, with a control room on the mezzanine at one end and garage doors at one side wide enough to admit a fleet of trucks driving abreast. One might wonder how - with all this electronic equipment to keep in order - Les gets any serious work done without the help of a full-time engineer. But the Les Paul and Mary Ford fan need not worry - even while this article was being written, word of their new contract with Columbia Records came out, and we can expect soon to hear a number of their records under the Columbia label.